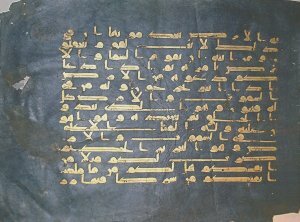 Description	 MS in Arabic on vellum dyed deep blue, Spain or Qairawan, Tunisia, 9th or 10th cent, 1 f 30x40 cm, single column (20x30 cm) 15 lines in Kufic script in gold, some diacritical strokes, large marginal medallion in silver. Context	 A larger section of the Blue Qur'an is in the National Institute of Art and Archaeology in Tunis, and detached leaves in the National Library, Tunis, and single leaves in many public and private collections. 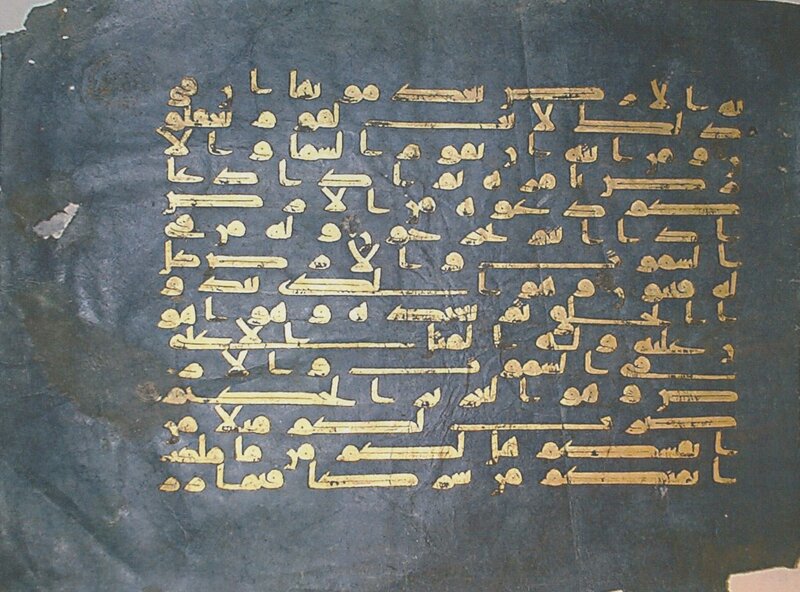 A blue Qur'an was mentioned in the library catalogue of 1294 in the Great Mosque at Qairawan. Provenance	 1. Sam Fogg, London, June 2001; 2. De-accessioned to Sam Fogg June 2005. Commentary	 The Blue Qur1an was one of the most luxurious Qur'ans ever produced in the early medieval period. The use of dark blue vellum and gold script was meant to rival the most luxurious MSS of the Byzantine Empire, which were dyed in purple. The same method, but on blue stained paper instead, but with both gold and silver ink, was applied in Japan, Tibet and China, see f inst MS 2169 from China 620-756 and NS 2342 from Kamakura, Japan, 10th to 11th cent.